This is an outfit that hunts a broad swath of private Colorado ground. He hunts south and West of Colorado Springs; he hunts the southeastern plains, he hunts the Montrose and Grand Junction areas and more. He hunts GMU’s 56, 59, 62, 70, 130, 136 137, 140, 581 and S60. 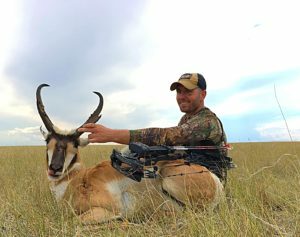 So whether you want a big Muley, big Whitetail, an elk or an antelope, he can do it for you on some prime ground. Some of his areas are draw areas, but frequently he will have a voucher, which allows you to avoid the draw and the need for preference points. This means you can often simply book the hunt, and know you will be going. You still must buy the license, but no draw! He also will help you apply if you have points or want to try and draw the hunt of your choice. ; or if he does not have a voucher available. Book early usually for best shots at a voucher. But sometimes he has them available into later months. Colorado draw is early April. 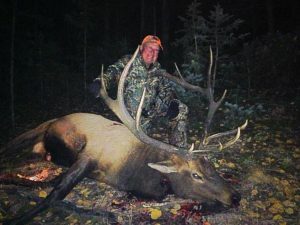 DOUG ARNOLD: Would hunt with him again anytime! Good quality animals and he works hard to make sure you have a good hunt. I harvested a 180 mule deer in velvet. He works his tail off ! This outfitter has been a guide and then an outfitter for most of his adult life, and outfitting, guiding and ranching run in his family. He has a fairly small family-run operation, with his father, brother and uncle all guiding for him. 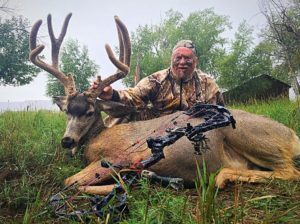 They enjoy high success rates on quality animals, and a 50%-60% repeat client rate (which is very good considering that many of his hunts require multiple points to draw so can’t be done every year). They also strive to get clients within about 200 yards for a shot, so long-range shooting is not usually needed. His passion is big mule deer. At age 14, he shot an incredible buck that scored 306 3/8” and still ranks #2 in the State and #12 overall! This guy knows big deer! Here in a short way is info on his various offerings, which are frankly too extensive to catalog here, but just ask us and we will guide you along the path. We will lay these out by the GMU hunted in general. 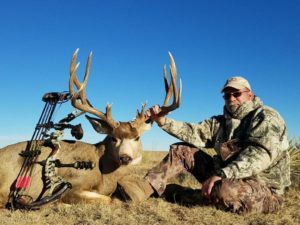 WC GMU 581: Hunt about 3000 acres west of famous West Colorado Springs. The Ranch sits at an elevation of 6,800 feet and steadily rises up to 8500’. Plenty of pinion pines, sage brush and ponderosa pines. All hunting on this ranch is conducted from a four wheel drive vehicle. Hunts starts at first light by hunting the low lying creek bottoms as the deer typically come down out of the hills to water. Then up to a high vantage point to spot the bucks feeding their way back up the hills to their bedding areas. Once a mature buck is found a stalk is made. The deer licenses are a little more difficult to come by without preference points but outfitter usually has 3-4 guaranteed vouchers per year. So you can count on going hunting! This property is managed for quality with bucks ranging in the 160 class to the 190 class with the occasional buck topping that mark. One preference point to 2 will draw the rifle deer. DBL GMU 56: This areas elk and deer are closely managed and their sizes are exceptional. Because of that this is one of the few areas in western Colorado that there are no over the counter or left over licenses even for 2nd and 3rd season. The leftover are never available because it requires a point to draw. If you don’t draw he has landowner vouchers for deer and elk. There are large numbers of elk and Mule deer here. Ranch is 2,000 acres, ranging from high ridges of pinyon, cedar and pine, down to agriculture along the Arkansas River bottom with its cottonwoods. Good tree stand there. Alfalfa surrounds on 3 sides!. 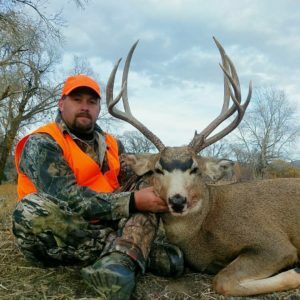 Muley run 160-180”. Need probably 3-4 points for mzldr elk; rifle elk 2 points, bow deer 2 points. UP INCREDIBLY QUICKLY! Plan on at least a year in advance to book. Preference points will usually be needed; generally at least 3 for mule deer, while elk is Over the Counter. Nice remodeled bunkhouse and home cooking. This is a place that consistently has produced muley’s in the 180-200+ class with some awesome spreads. It will take 8 to 12 preference points to draw here!!. It may be possible in 2019 to pay extra for a voucher if you do not have points- but get in line right now! 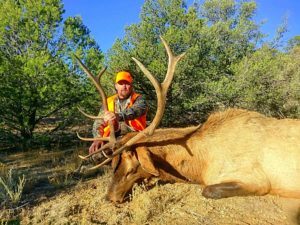 Ranch consists of a cottonwood creek bottom, numerous pinion, juniper and cedar canyons with mountain mahogany plants as well as various other highly sought after deer browse. In addition to the exceptional feed and habitat the age structure is managed to produce big deer. ELK- this is a special unit where you can rifle hunt in September during the bugle! Bulls can run into the 300 to 320- a few bigger, but low elk numbers, so you work for them. Only 4 hunts per year! WHITETAILS: Hunt the river bottom. Considered to be a bit of a management hunt to hold the whitetail numbers down. They can reach 140 class. 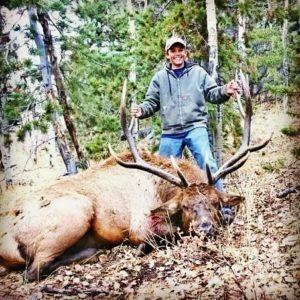 Preference points needed: deer – 8-12 points; elk OTC- no points needed.